Kelsall has been shaped by its geographic position in the cleft of the sandstone ridge which crosses Cheshire from the Mersey to the Shropshire border. In the Iron Age this gap was protected by fortifications on Kelsborrow Hill and Eddisbury Hill, and later, the Roman road, Watling Street, passed through it. The hamlet which grew up along the road retained its long, narrow elongated shape unchanged for centuries, and was, from the time of the Normans, part of the ancient royal hunting ground of Mara et Mondrem, although it would be a mistake to imagine it all covered with trees. Much of it was open, undulating country, with occasional stretches of woodland. Longley was wooded, had good drainage and possessed fine spring water, and mineral wealth. Sandstone was being quarried here by 1627. In contrast the marshland, the low lying area between Willington and Pryor's Heyes was prone to flooding. 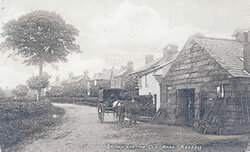 The survival of the settlers in the area depended on employment in the forest or quarries, and on the cultivation of the open fields and strips (the town fields) at the western end of the village around Back Lane and Barbers Lane. 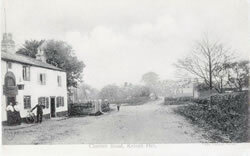 As the settlement in the vicinity of Dog Lane grew, so did the encroachments on the common land, especially Longley Common. However it was not until after the mid 18th century that pressure was building up, both locally and nationally, to enclose the commons for cultivation and thereby improve the productivity of agriculture. It was stimulated by industrial and commercial expansion and by population growth, at a time when Britain was involved in the Napoleonic Wars, and self sufficiency in agriculture appeared essential. 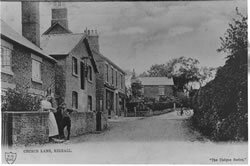 By the time an Act of Parliament was passed to facilitate the enclosure in the early 19th century, many Kelsall residents had already taken up common land and built their cottages on it without permission and without paying rent. Not surprising then, that, when the surveyor sent by the Master Forester's Land Agent arrived, he met with passive resistance from the offenders. Kelsall Hall Farm was carved out of Longley after enclosure and continued to be thickly wooded for many years. The cart track, which served the farm, eventually became Hall Lane. Kelsall Smeath or Weetwood Common was also enclosed, and carved out of it were 55 acres to become a new farm, The Commons. Within it were 4 acres set aside as a marl pit for community use. In spite of the growing momentum of enclosure, Delamere retained its identity as a Crown Forest until the Act of Parliament of 1812. In that year, what was described as "a large dreary tract of wasteland" was officially 'deforested'. It consisted of approximately 8,000 acres of light sandy infertile soil. Most was allotted to private owners but the Crown retained some land including the two Pales, which were ancient enclosures within the forest, under the Surveyor of Woods and Forests (now the Forestry Commission) and this was the foundation of the modern Delamere Forest. The Old Road (Old Coach Road), looking east. The Smithy, east end of The Old Road. The surveyor for the Kelsall enclosure award was Josiah Boydell. His map showed the allocation of allotments to be small in size and concentrated in an area stretching from the Talbot Inn at the north end of the Coach Road to its western end at its junction with and including Dewsbury Lane (now Duttons Lane) Important landmarks were the inns - the Talbot, the Globe, and the Blue Bell, which stood at the head of Red Hill. Photo courtesy Mike Ford (Farmers Arms). One of the most valuable features of enclosure was improved roads. 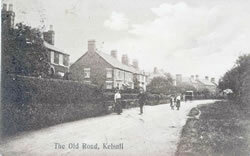 'Surveyor's roads' created at the time, are still a feature of the Kelsall landscape. Nine public carriageways were set out, recognisable by their military precision. As corn mills were essential to the community, the cart track to Hall's Mill at Willington across Weetwood Common was improved, and came to be known as Common Lane. Access to the mill at Duddon was improved by the surveyor's road to Oscroft, namely Willington Road. 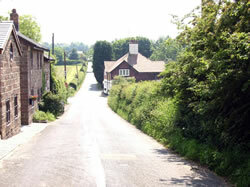 Also included were Tirley Lane which gave access to Whistlebitch Well (widely known for its medicinal qualities), the Yeld, Waste Lane and Dogmoor Well Lane, also known as Willington Lane and subsequently known as Quarry Lane, which was created to give improved access to Willington. Obviously its modern name was the result of the opening up of the quarries in 1816 by the enterprising Liverpool merchant, John Gunnery. He purchased 4 acres of the eastern escarpment for £143.00. Quarrying continued until the 1880's. Then for £285 the quarry became the property of a speculative builder who erected 8 houses on the quarry floor; the final one being his own, built in brick! up towards Church Street North. Also created were 'occupation roads' to be kept in order by the people through whose land they passed, and bridleways and footpaths which were to be maintained by the landowners. For example, the access to Dogmoor Well off Quarry Lane, or the footpath to the thatcher's cottage, which was widened to 10 feet, and became known as Thatchers Lane - now Dingle Lane. During the enclosure process, parcels of land were set aside for public use and in the township of Kelsall, these included marl pits where a limey clay could be dug out by all local farmers and cottagers without charge, to remedy the poor soil. Marling was an old custom dating back to the Celtic tribes, and old farm leases usually contained a clause that tenants applied marl to the land at stated intervals. Gangs of 'marlers' each under the command of a 'captain' travelled about the countryside digging the pits, many of which are now small ponds. The marl pit in the north of the village was dug out of the Yeld. 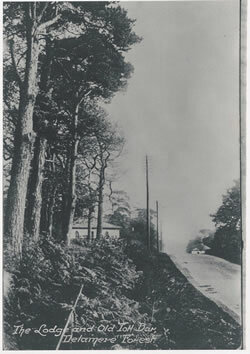 The lane to the pit from the forest was created by the 1812 award and named Marl Pit Lane, now Forest Gate Lane. The original stone stile at the entrance to Nettleford still exists. From there, the road through the forest was called Rutters Lane because it led to George Rutter's lodge in the forest now known as Forest Farm. Another marl pit was sited at the top of the Waste. The central marl pit was on the triangle on which the former Church Hall (now an office) and old Parsonage stand - Church St North. The southern marl pit was off Common Lane. By the early 19th century the main artery to the village through the forest was the Northwich turnpike(dating from 1769) which had terminated by the Toll Cottage at Gresty's Waste. 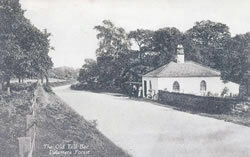 Following the enclosure of the forest, the Chester Turnpike Trustees took the decision to extend their road from Chester up the final stretch of Kelsall Hill. The existing route was very steep; climbing from the Globe Inn (Morris Dancer) via Chapel Bank and Grub Lane to link with the Old Coach Road. On October 31st 1828 the Trustees invited their surveyor "to examine the several lines of road proposed for avoiding the steep ascent at Kelsall Hill" The construction of the New Chester Road became in effect the first Kelsall bypass! It is clearly shown on the 1838 Tithe Map, which in itself is a valuable source of information. 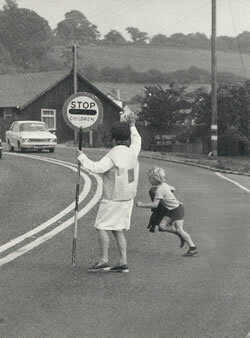 Lollipop Lady! (photo courtesy A O'Donnell). By the mid 20th century the New Chester Road (A54 Trunk Road) with its tortuous alignment and steep gradients was unable to cope with the increased traffic flow and larger size of heavy goods vehicles. The associated noise, fumes and intrusion combined over the years to exacerbate environmental problems. There were no footways on one side of the road for most of its length, and the two major crossing points had limited visibility. Hardly surprising then, that the demands of the community for a bypass became more and more urgent, not least in the interests of safety. They had had a long wait! A Public Enquiry to consider the route of the bypass was held in the summer of 1983. The contract to build the road was awarded to Shand Ltd and work commenced on 25th March 1985. 290,000 cubic metres of earth were excavated and then re-used as fill in embankments and landscape areas. The Bypass, which is 3.5 km long, leaves the existing A54 near 'Ingress House' at its western end and climbs steadily through open country. It crosses over a realigned Hollands Lane on a 9m embankment, and as the ground rises steeply it moves into a cutting. Bridges were constructed over a new road at Hall Lane and at Yeld Lane. The maximum cutting depth of 12 m occurs near Yeld Lane before the road rejoins the existing A54 near 'The Lodge'. The contract was completed on 6th October 1986. The opening of the Bypass also provided the opportunity to eventually get rid of the unsightly footbridge at Church St North, which had been erected as a temporary measure in 1973, for the safe crossing of the trunk road for those able to negotiate its 70 or so steps!